Turkey is blessed with everything the British tourist would want – beautiful weather, fantastic food, interesting history, incredible beaches and thanks to the exchange rate, it’s really affordable. Your money goes a long way in Turkey, making it one of the best value destinations within a few hours flight of the UK. In todays article we are going to focus on one particular resort in Turkey, a place that ticks every box for the tourist, Olu Deniz. 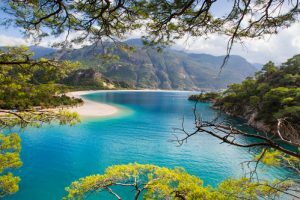 For the sun-loving beach bum, there are few places on the planet more spectacular than Olu Deniz.Voted as the best beach in the world in numerous travel magazines, it really is a sight to behold. The literal translation of Olu Deniz is ‘dead sea’, owing the fall calm waters even during stormy times. If you’re a fan of diving or just like a paddle around with goggles or a snorkel on, you’re in heaven here. The water is wonderfully warm and is abundant with fish, giving you a lot of interesting sights. It’s like a deep-dive in a tropical fish tank, but you are observing the fish in their natural environment. The beach itself is a long strip of golden sand around 3 miles long, with a sandy spur at its westernmost tip. The spur provides an enclosed shelter for the world-famous blue lagoon, a large, flat-calm and warm expanse of beautiful blue water. 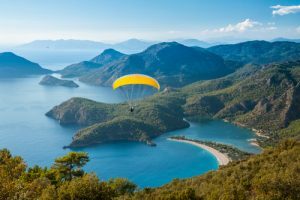 If you’ve seen pictures of Olu Deniz, you’ve seen the real thing – it really is that spectacular. Thanks to the incredibly strict planning rules, the village of Olu Deniz doesn’t have the high-rise buildings that has destroyed much of the touristic Spanish coastline. There are very few buildings over two stories high, meaning the seafront has been left largely unspoiled. The village of Olu Deniz has been developed into a small town with the usual mix of bars, restaurants and tourist shops. There are also vendors selling excursions and experiences, some of which are an excellent chance to visit the other areas of the local coastline, including the world-famous Butterfly Valley, home to 105 different species of butterfly native to the valley. 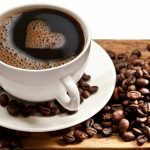 Some argue that the small town of Olu Deniz has been spoiled by tourism, but having been there myself I can assure you that in and around the town you can still find traditional Turkish foods and restaurants. You can easily escape the neon nightmare than has swept through many popular tourist destinations. You can even venture into the local big town of Fethiye if you fancy a more local experience. The surrounding towns of Ovacik and Hisaronu have been blighted by the more touristy bars, with lots of neon lights, loud music, cheap drinks and drunk tourists. If that’s your bag, you’ll be spoiled for choice here. Personally speaking, it’s not for me but each to their own! A unique feature of Olu Deniz is the proximity to Mount Babadağ. It sits overlooking the bay, reaching a height of 6,460 feet. From here, local paragliders launch themselves into the warm, calm air and towards and gentle descent to the beach. Sunbathers are treated to the sight of the paragliders gently making their way towards the golden sands below. Anyone wanting to have a go themselves can do so – there are numerous companies on the seafront who offer the experience for a relatively cheap price. Probably not a good idea for those scared of heights! If food is your thing, you can eat some seriously good dishes. The Turkish cuisine involves lots of slow-cooked meats, interesting salads and breads, fresh seafood and interesting spices. There are also some great local beers to help the food go down. If you want an active holiday, you can swim in the beautiful sea, scuba dive, run along the sea front, climb the impressive Mount Babadağ, paraglide down to the beach or hire a kayak to paddle around the lagoon and the beautiful bay. If you want a drop and flop holiday, where you like on the beach soaking up some sun, it’s perfect. With an average summer temperature in the low thirties and almost no rain, it’s as close to guaranteed sun that you’re likely to get. Thanks to the fact that it’s a 4 hour flight from the UK, it isn’t as popular as many of the closer resorts. Despite that, it still attracts many visitors because it really is that stunning. Even with its popularity, it isn’t over-crowded, especially if you can visit in September where you’ll still benefit from temperatures in the 30’s, but the trip will be cheaper and the crowds will have thinned. If you haven’t been, put it on your list – you’ll be thankful you did.